Who doesn't love Banana and Chocolate? They are a favorite in our house. These Banana Chocolate Chip bars didn't last long and i almost forgot to take a picture, hence the piece missing. My kids are asking for me to make more again. 2- Prepare ripe bananas. Then mash well. 3- Add brown sugar, applesauce, milk and eggs.Stir. 4- Slowly combine flour, baking soda, salt, and cinnamon. 5- Fold in chocolate chips. 6- Spread mixture in baking pan. 7- Bake for 18-22 minutes. 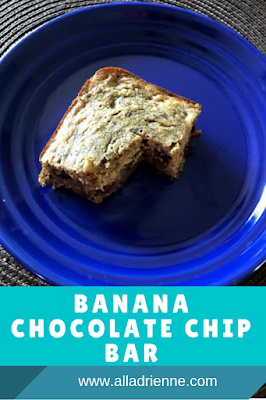 Your Banana Chocolate Chip Bar looks delicious! Thanks so much for sharing with Full Plate Thursday and have a great week!